Researchers develop a CRISPR-based technique that efficiently corrects point mutations without cleaving DNA. 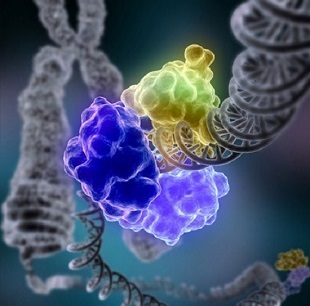 Illustration of DNA ligase, one of the cell proteins involved in repairing double-strand breaks in DNAWIKIMEDIA; WASHINGTON UNIVERSITY SCHOOL OF MEDICINE IN ST. LOUIS, TOM ELLENBERGERMost genetic diseases in humans are caused by point mutations—single base errors in the DNA sequence. 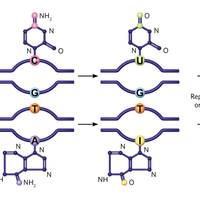 However, current genome-editing methods cannot efficiently correct these mutations in cells, and often cause random nucleotide insertions or deletions (indels) as a byproduct. Now, researchers at Harvard University have modified CRISPR/Cas9 technology to get around these problems, creating a new “base editor,” described today (April 20) in Nature, which permanently and efficiently converts cytosine (C) to uracil (U) bases with low error in human and mouse cell lines. 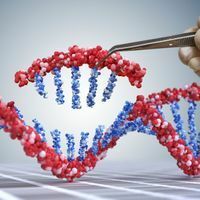 To date, CRISPR/Cas9 genome-editing approaches have relied on a cellular mechanism called homology-directed repair, which is triggered by double-strand breaks in DNA. Researchers supply cells with a template containing the desired sequence, make a targeted double-strand break with the Cas9 enzyme, and then wait to see whether homology-directed repair incorporates the template to reconnect the strands. Unfortunately, this method is inefficient (incorporation is rare) and often introduces new errors in the form of random indels around the break, making it impractical for therapeutic correction of point mutations. The bulge alerts a different cellular repair mechanism, mismatch repair, which removes one of the mismatched bases and replaces it with the complement to the remaining one. 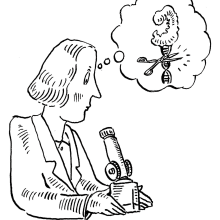 Without any information about which base is incorrect, mismatch repair produces the desired G to A conversion about 50 percent of the time; the rest of the time it converts the U back into a C.
Using the technique at six loci in human cells, the team reported a targeted base correction rate of up to 37 percent, with only around 1 percent of the sequences showing indels. By contrast, a normal Cas9 editing technique tested on three of those loci showed less than one percent efficiency, and more than four percent formation of indels. The researchers also demonstrated the technique’s potential to correct disease-associated mutations by converting a variant of APOE, a gene linked with Alzheimer’s, into a lower risk version in mouse cells. 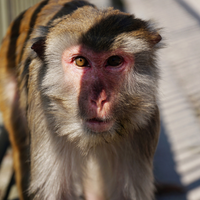 Also appearing in Nature today are two studies addressing a potential alternative to Cas9: the Cpf1 enzyme. CRISPR/Cpf1 creates “sticky ends”—overhangs in cleaved DNA that leave unpaired bases either side of the break—rather than the blunt ends made by Cas9’s double-strand DNA cleavage. Emmanuelle Charpentier and colleagues at the Max Planck Institute for Infection Biology in Germany have shown that, unlike Cas9, Cpf1 processes RNA in addition to cleaving DNA. Meanwhile, Zhiwei Huang of the Harbin Institute of Technology, China, and colleagues have described the crystal structure of CRISPR/Cpf1. D. Dong et al., “The crystal structure of Cpf1 in complex with CRISPR RNA,” Nature, doi:10.1038/nature17944, 2016. I. Fonfara et al., “The CRISPR-associated DNA-cleaving enzyme Cpf1 also processes precursor CRISPR RNA,” Nature, doi:10.1038/nature17945, 2016. A.C. Komor et al., “Programmable editing of a target base in genomic DNA without double-stranded DNA cleavage,” Nature, doi:10.1038/nature17946, 2016.